Not only it snags Hollywood celebrity endorsers, it also focuses now to become Asia’s most admired fashion brand. EDSA these days is not only notorious for its standstill traffic: It has become a prime spot for gigantic billboards of various brands, among them Penshoppe, whose Hollywood endorsers like One Direction, Zac Efron, Kendall Jenner’s billboards dot the main thoroughfare’s stretch. Apart from pulling one marketing coup after another, the 30-year-old brand under Golden ABC has been aggressively expanding overseas, aiming to be the most admired Asian fashion brand with its growing presence in the region, setting up outlets in the Middle East and other neighboring countries in Southeast Asia. But make no mistake, the brand was never an overnight success. The last three decades have been coupled with costly closings, along with severe setbacks. But Golden ABC CEO Bernie Liu believes the one thing that keep them thriving is its passion to succeed. The CEO shared in the latest PLDT SME Nation Big Talks conference on Thursday, June 2 how the company endured through several crises and how it aims to be the next big brand in Asia. Liu’s parents started a lumber business to sustain the family in Cebu which eventually grew to other industries, including wood and garment businesses. The young Liu used to go home straight from school to help in their shop, with their summers almost always spent at home too as the whole family helped run the business. “The first generation of my parents built the core values of the business. The values of hard work, resilience, discipline, care for employees, stewardship, and excellence. When the second generation finally joined the business, it became our role to take into heart what we have learned from our parents,” Liu said in his keynote speech. During the years he was studying architecture, Liu designed graphic tees with a group of friends on the side, to earn extra income in school. So even when he was already a licensed architect, Liu decided to pursue the retail business instead. “I had a simple business plan and my parents agreed that we turn our garments business into a retail fashion one instead,” Liu said who spent a year and a half in their wood enterprise before proposing the plan. In 1986, Liu opened his first shop in Cebu, about a month after the People Power Revolution. Even with the tricky market circumstance, the shop was a success, that in five years’ time, they opened their first store in Metro Manila at SM City North EDSA. “My past time later on fueled my passion which grew into something I cultivated and grew to love as a lifelong career,” Liu said. That hobby may not have only fueled his passion, it set it on fire, as three decades after its inception, Penshoppe now has six other sister brands, and 700 brick-and-mortar stores with presence in 12 countries worldwide. It grew humbly from 14 employees in 1986 to 3,000 today, with its workforce having an average age of 26-years-old, who keeps up with the fast-changing taste of consumers. “Our people are youthful, agile, eager, creative, and fearless. I am transparent with them on where we fail and succeed because the best talents cannot help us if they don’t have access to accurate information,” Liu added. Many of the biggest companies today highlight the importance of company culture, from the playful environment of Google to the open spaces of Facebook and Penshoppe takes no exemption. “Having a clearly defined company culture will help you set in motion your goals. Without its people, a company cannot accomplish anything,” he said. This sincere care for employees originates back to the first generation of Lius when Bernie’s father even flew in some employees from Manila to Cebu so they could continue to have jobs and work for the company. And with a dedicated team comes a dedicated system. For a company with vast network of more than 500, investing in the right infrastructure is pillar for a successful retail business. The Cebuano native boasts the company’s highly advanced supply chain system, as they could easily track each aspect of the business in the nick of time. “At any given period, we can track our 80,000 active supply keeping units. We continue to make substantial investment in technology to allow us to grow better and faster. [This also] allows us to monitor our activities more accurately and make informed decisions faster and adopt to market needs swiftly,” Liu said. But like how success stories go, the plot gets more exciting with each setback. 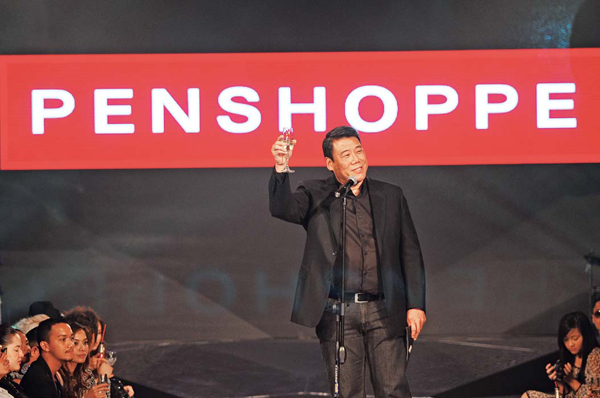 On its first bid to go international, Penshoppe, ambitious as it is, went to China without the necessary business knowledge, and had to close shop in a few months’ time. Originating from a tropical country, Penshoppe had little literature on fall and winter fashion to thrive in the region. The same story happened in Norway, where it also had to stop operations with their limited winter clothing selection. Liu admits it was a costly failure, but the experience and lessons that came with it were priceless. “Failure can have this damaging effect to a business owner, the initial excitement of a business venture dissipates and it is replaced by a psyche. One can get paralyzed by fear and become conservative in making decisions,” Liu said. However, the CEO emphasized that as entrepreneurs, one must learn to play with fire, and treat each setback with as an opportunity to grow. In the last 10 years, Penshoppe has done nothing short of risky moves. It has tapped the biggest international stars to sport its gear to keep its relevance in the global market. Some have questioned how this keeps the brand wholly Filipino when it has to get the endorsement of foreign stars. For Liu, the answer is simple. “If the biggest stars get their hands on a proudly Filipino brand and say to their thousands of fans how much they love it, how does it make you feel as a Filipino?” Liu dared.